“Do you know where you are? You’re in the vineyard baby!” Well that’s what we imagine the lyrics would be if Axl were in a band called Guns N’ Rosés. 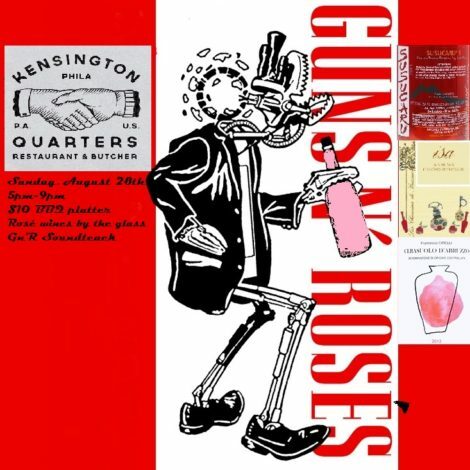 On Sunday, we all get to celebrate this alternate reality at Kensington Quarters, where chef Damon Menapace and wine guy extraordinaire Tim Kweeder will be cooking barbecue, pouring rosé wine and cranking an all Guns N’ Roses soundtrack. The party starts at 5 p.m. with five or more rosé wines on special. It’ll be the perfect antidote to the Brooklyn Brewery Mash happening on Frankford Avenue this Sunday.